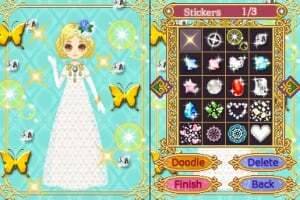 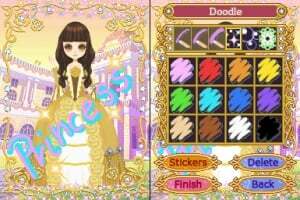 Welcome to the dazzling world of Anne’s Doll Studio: Princess Collection! 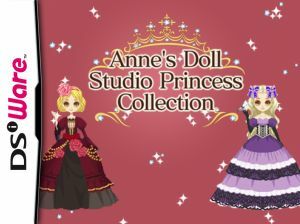 Dress your doll from head to toe, turning them into a stunning princess, selecting from a wide range of gorgeous princess-themed dresses, accessories, shoes, etc.! 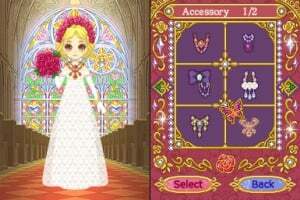 In order to dress your doll, use the stylus to select your doll’s hairstyle, hair accessory, dress and jewellery. 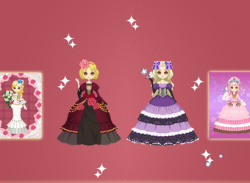 Once you have completed styling your doll, you can now create a picture by choosing the wallpaper and frame for your princess! 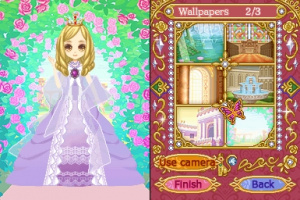 Players can also choose to use the built-in camera of their Nintendo DSi or Nintendo 3DS system, to take a picture to use as their wallpaper instead. To further decorate your picture, you can add as many stamps as you like and even draw freehand! Lastly, you can share your completed doll picture by saving it on an SD Card (sold separately) and sharing it or using it on social networks, mailing it to friends and family as a card, or by simply printing it out.